I am still getting our apartment decorated for fall (because it’s still not too late, it’s not December yet!) 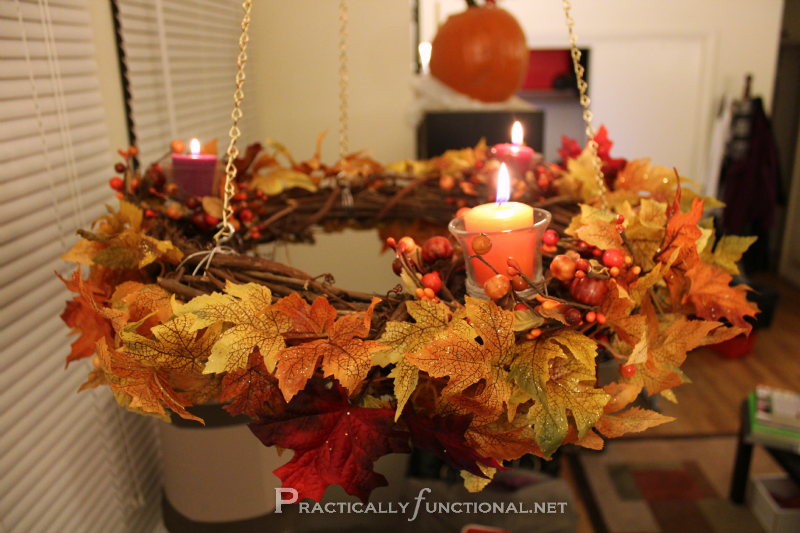 So today I’m sharing an easy tutorial for making a hanging fall wreath chandelier. 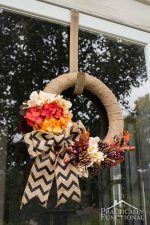 We’re not supposed to hang wreaths or any decorations on the front door of our apartment, but I still wanted a fall wreath. So I made one, turned it on it’s side, and hung it right above my desk! 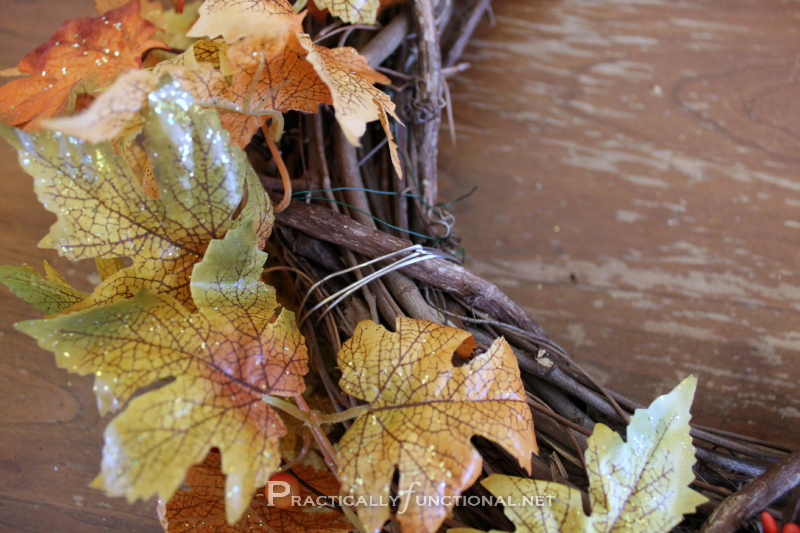 I went to Michaels and found an 18″ grapevine wreath in their floral section. 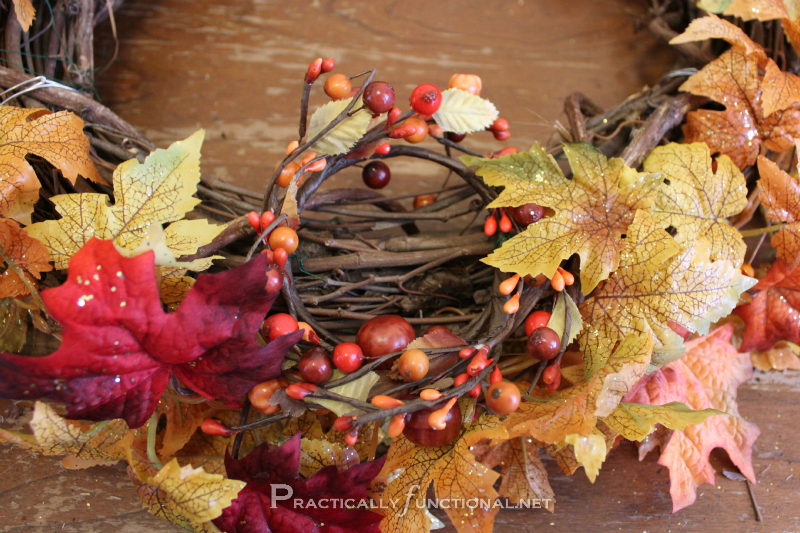 I also found a fall garland and some tiny circular wreaths on sale, perfect! 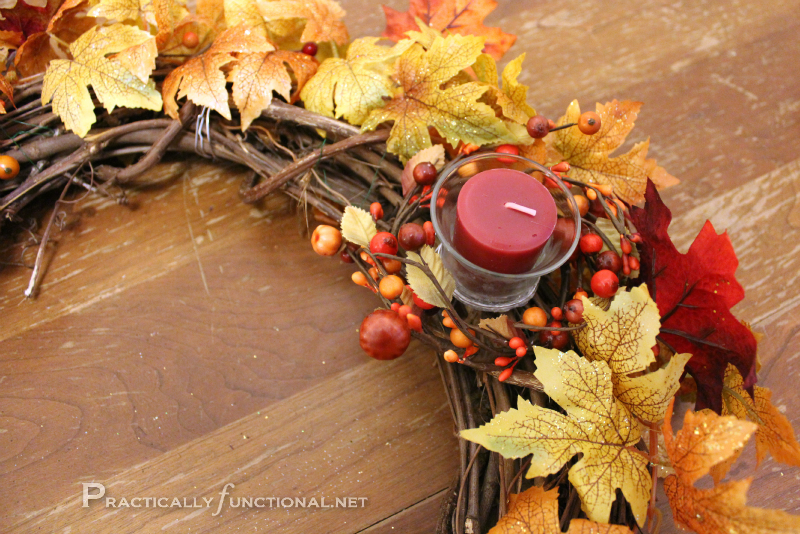 Plus I still had some leaves left over from my fall decor for under $5 project, so I was set. I’m not going to give detailed instructions as to how I put this wreath together because every wreath can be different (I don’t want to stifle your creative spirit!) But here are the basics. 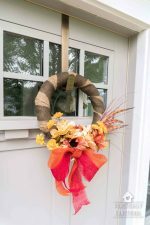 I started by wrapping the fall leaves garland around the outer edges of the wreath. 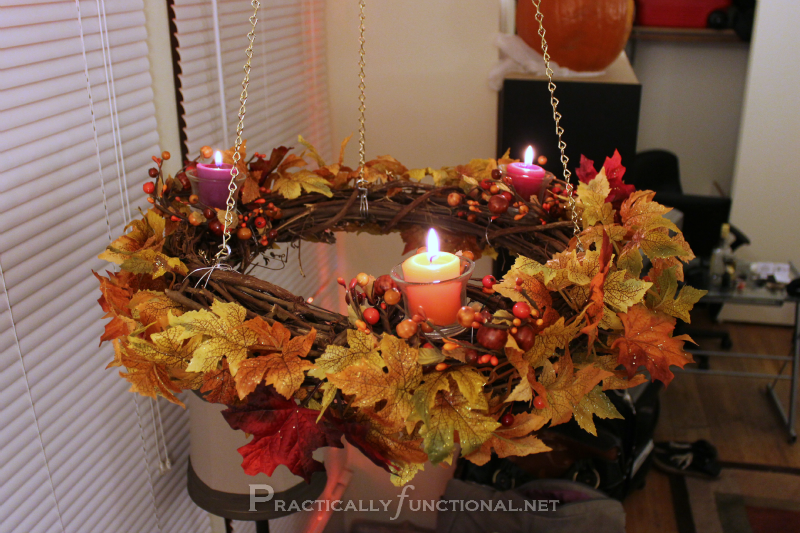 Knowing that this fall wreath chandelier would be suspended above my desk, I tried to make sure that most of the decorations were on the outside/underside of the wreath. No one we know is tall enough to see the very top anyway! 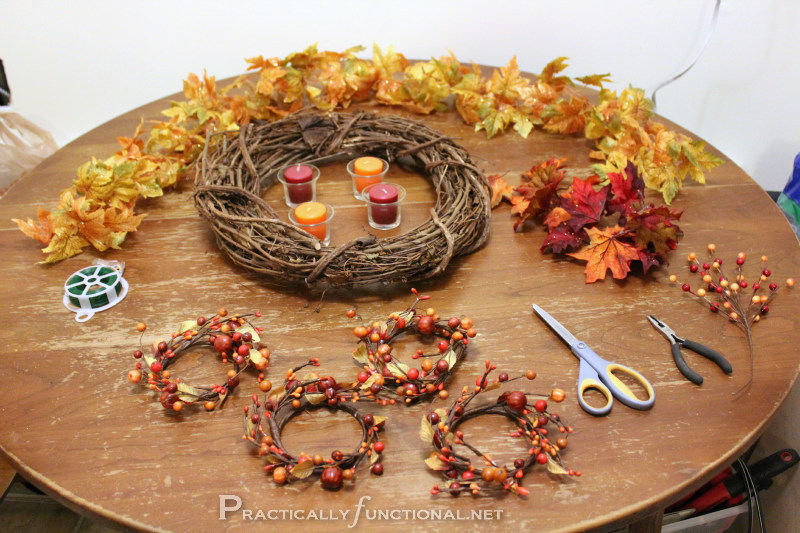 I used the same floral wire to add a few extra leaves, some little autumn beads, and some tiny wreaths to encircle the candle holders. I called my dad and his advice was to use silicone glue to attach wire to the glass candle holders. Brilliant! Silicone glue is very strong, but the bond is flexible. If something jostles the wire attached to the glass, it won’t put strain on the glass and possibly crack or shatter it. Yay! I put a thin line of silicone glue around the bottom of the candle holder, and then I wrapped about two feet of the 18 gauge wire around each one. I pulled the wire tight and twisted it to hold it steady; you are supposed to hold the pieces together for at least 5 minutes while the silicone glue starts to dry. It takes 24 hours to fully cure, but after about 10-15 minutes the glue was dry enough to attach the candle holders to the wreath. 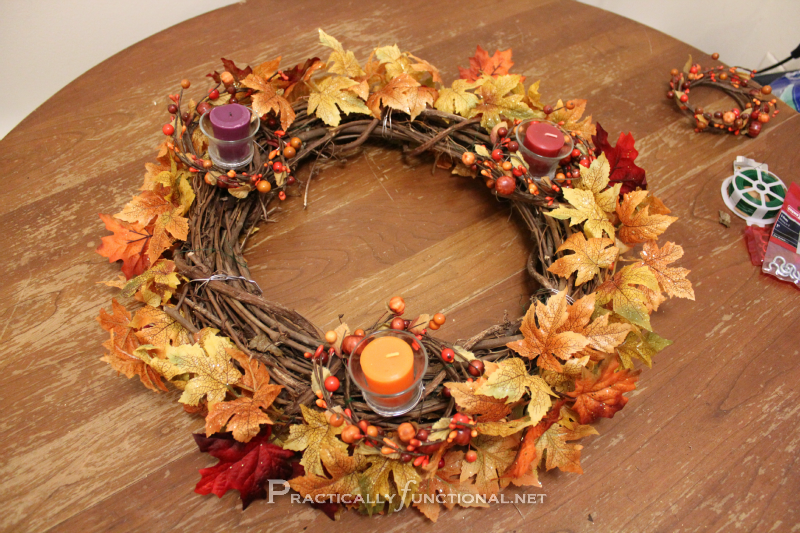 Once the glue was dry, I set the candle holders inside the tiny wreaths, wrapped the wires around the underside of the grapevine wreath, and twisted them to secure it. I wanted a really durable and secure way to hang the wreath, so I wrapped more of the 18 gauge wire around the grapevine wreath base a few times in between each of the candle holders. Then I took some gold chain and cut it into three sections of equal length. 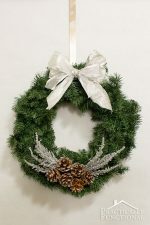 I used s-hooks to attach one end of the chains to the sections of wire wrapped around the wreath. Then I took the other ends of all three chains, put them together on one more s-hook, and hung the whole thing from a ceiling hook above my desk. Done! What do you think? 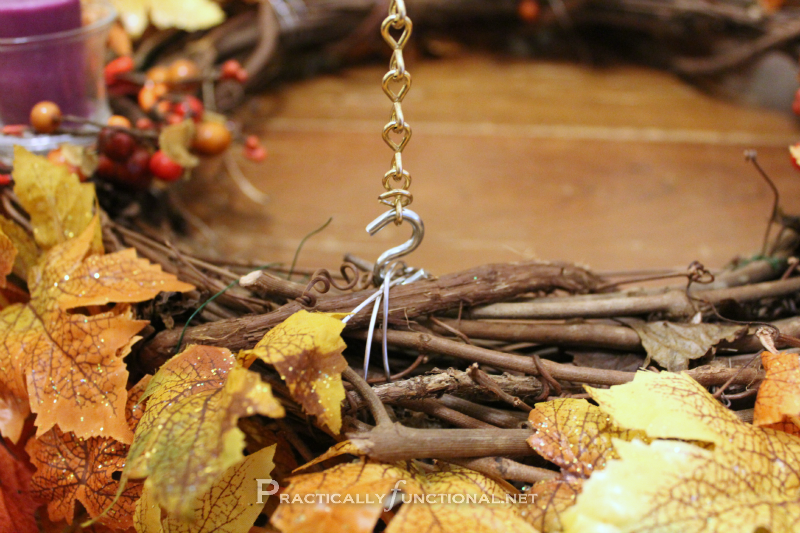 Have you ever turned a wreath sideways? I really love the way it looks, and now I have decorations on this side of the room as well! This picture from Martha Stewart was my inspiration for this project. I didn’t make tiny pumpkins into candle holders, but I love my version just as much! Yeah, brave, or stupid. I tried to make sure to hang it high enough that the cats won’t be interested in it. 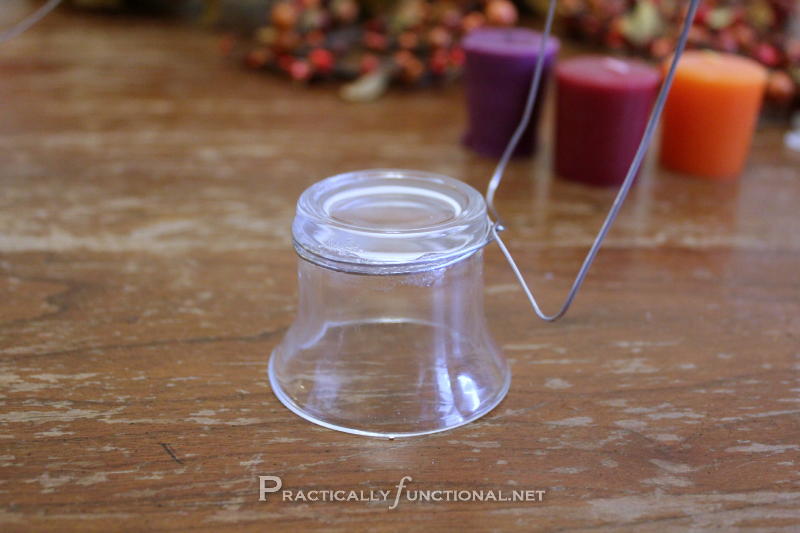 The wire and glue is definitely strong enough to hold the candles on by themselves, but probably not if a cat jumped up there… 🙂 And you can definitely make an Advent wreath! Such a good idea! 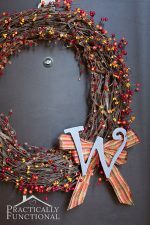 Im still working on my fall wreath… But if Im a very good girl I might be done by christmas, lol! Lol, I know how that goes sometimes! Lol! I was a bit worried about the flames with these mischievous cats we have, but so far they seem completely uninterested in it, so that’s good. 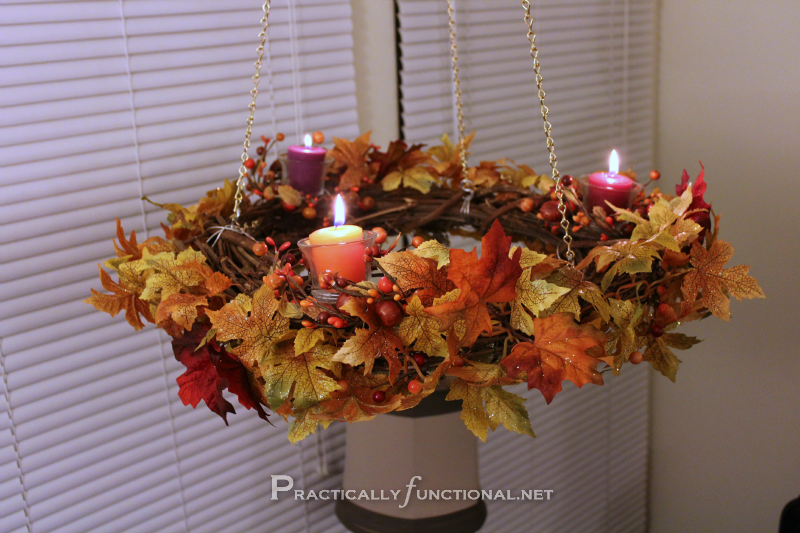 Love your wreath chandelier! I’d like to invite you to share it at my party, Twirl & Take a Bow at http://www.houseontheway.com. Found you at the CHQ blog hop. I’m your newest follower on twitter. 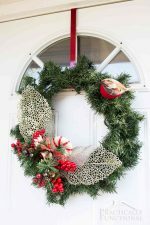 Your wreath looks great! What a smart idea to hang it horizontally versus the standard vertical. Great job. So pretty! 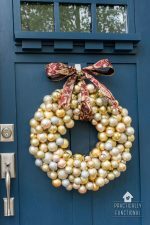 I would never even think of using a wreath this way! this is very lovely! such a great idea. thanks for this interesting and amazing tutorial. Thank you for sharing at the Thursday Favorite Things hop. xo P.S. Have you entered my latest giveaway? This is so pretty! I love it! I’m going to pin this to give a try sometime! 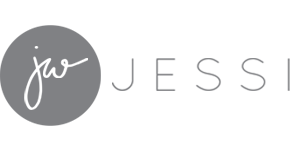 Wow – so creative!! And so pretty!! Thanks for visiting and linking up at Romance on a dime. I’m pinning this. Wow, this turned out lovely! Would love it if you linked up on my blog hop http://www.w-t-fab.com/search/label/bloghop. Also let me know if you’d like to follow each other! What a great looking chandy you made. I’m loving it. Hope you visit me from Katie’s blog hop. I hopped on over from her post. I just love this and it is WAY more budget-friendly than similar items for sale would be! I shared this and one of your other projects on my Some Kind of Wonderful Saturday Party! I hope you stop by and share more of your projects. They are just amazing! I know I will definitely be back. Not only do I love your projects, but they actually fit in my tiny craft budget!